MTL à Table: Eleven of the best days of the year, thanks to 150 restaurants flaunting Quebec’s native species through set menus at reduced prices. Resto Week ran November 1-11, but all menus can still be drooled over here. Following are just four of them. Maybe my line of sight was submerged into a tank for the night because I sat at the bar. Or the low lighting and inky dishware made me remember how the moon hits the ocean back home. My only certainty is that Accords le Bistro took me out to sea. The appetizer led me in ankle-deep. Black pudding, an island encased in a fragile pastry shell, waded in a shallow pond of rhubarb, sorrel, and caraway. Although the blood itself was salty, the gravy was sweet, broken up by flotillas of fruit. Silvery-skinned meunière sea bream glistened on a bed of Jerusalem artichokes and mushroom cream. Cracklings of some foreign ingredient edged the fillet like speckled foam hitting a shore. The dish tasted like a day spent foraging for mushrooms in the woods, ended by preparing the meal seaside, where a garnish of watercress was added last-minute. Dipping into the sea buckthorn and coconut panna cotta felt like skinny dipping. Past the surface of celery sprouts and smoked hazelnuts was a coolness. The accompanying pear wine was not there to hold your hand as you swam, but to egg you into the chilling water and help you adjust. It was the kind of dessert that makes you believe in good things to come, a diving board into a week of dining out. My seat allowed passerby to window shop for me, but the darkness of the space seduced me so that I didn’t notice. I was happy, flattered even, to dine in plain sight at the chic M.Mme. To begin with, foie gras nestled up beside a pillowy canelé de bordeaux. Half of a physalis and its jam lent that peculiar, round tartness that only the Quebec fruit offers. Salted cacao crumbles were a biting reminder that there is no better way to start off a meal than with something sugary. The dish was a candylike surprise that you hope to find left under your pillow by a tooth fairy with expensive taste. A plate of parmesan and chanterelle ravioli came out next in a sheen of white wine sauce and a crest of black truffle. Baby arugula and toasted parmesan topped off the pasta, supplementing the heavenly dish with an earthy lilt. 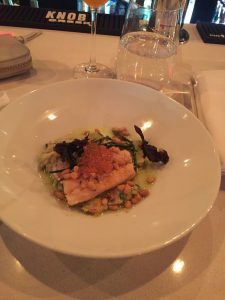 The restaurant is known for its sommelier, Bertrand Eichel, one of the best in Quebec. I know little of wine or love, but the ravioli and Lacrima di Morro d’Alba pairing was surely marriage. A plate of duck breast bathed in an apple cider and honey sauce and a swipe of squash purée stole the evening. Cabbage and bacon played supporting roles, but they were shadows. The duck melted in the mouth. Elegantly, sweetly. Dessert, a spirited five-spiced apple pie on top a rosewater and almond frangipane, proved too dense for the work of a spoon. 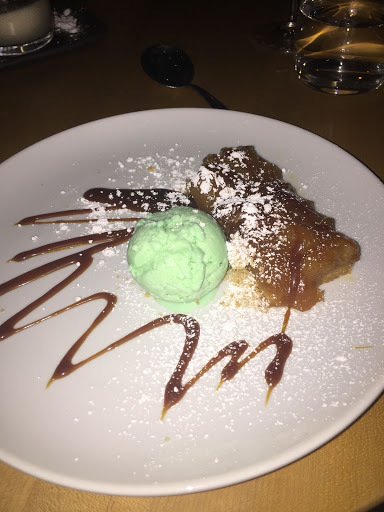 Mint ice cream, which also had notes of rosewater, invigorated the entire plate, an ample zing for the log of apples and a treat brilliant enough to be served single-scoop with nothing more. On Friday night, I ended up at a stranger’s home that I would have gladly stayed the night at. Chez Bouffe has a narrow foyer, a living room of flea market sofas, and a bartender who offers you amber MacTavish beer instead of wine to go with your meal. Graciously accept the hospitality. Flavorful through and through, the salmon tartare, punctuated with pomelo and ginger, was made for scooping onto the cushiony bread. Slather on the avocado butter, dab it into the avocado mousse, consume, sip beer, lick fingers, lick plate. 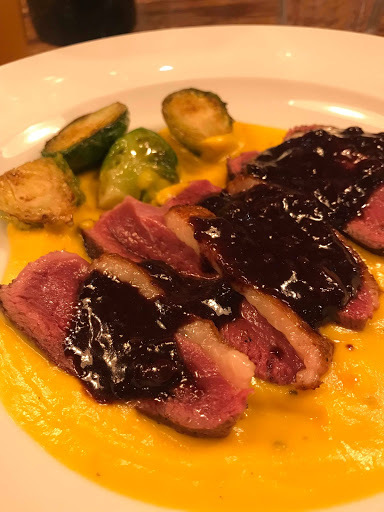 Next came seared duck thighs, served straightforwardly red in a veal juice reduction, waiting under a dribble of blueberry and orange sauce. Brussel sprouts reminded you of the food pyramid’s existence without inciting a groan, as they were roasted to a pale golden, simply peppered appearance. 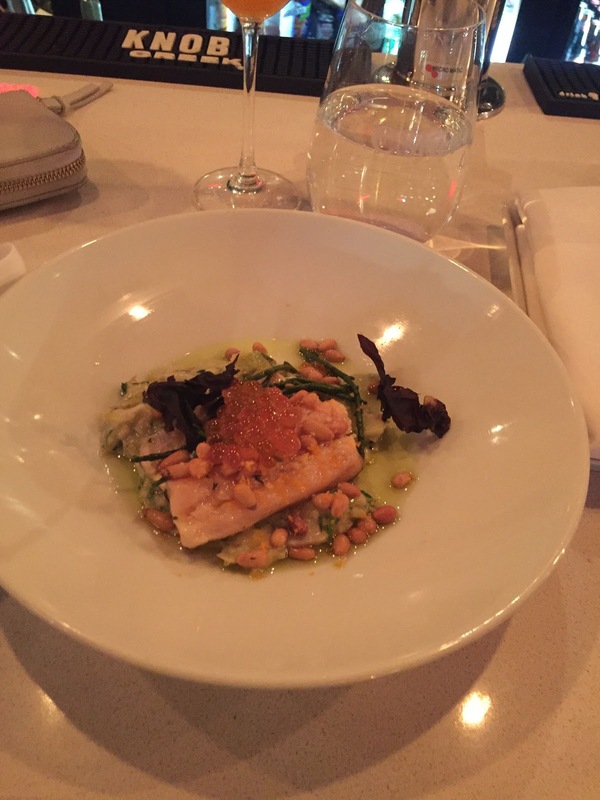 The salmon dish included a stupidly salty artichoke puree that also tasted of potatoes. Chorizo nibs and a balsamic reduction meant more salt, but the salmon skin was crispy, crispy goodness, and the chorizo popped well on top of that. There was a sense that I maybe could have made the dish at home, and that I maybe someday would, but I maybe didn’t care at all because the food suited the stellar beer and the stranger’s home. The mango and honey panna cotta tasted like something handed out in a backyard party under colorful lights and paper lanterns. This is really meant in the best way. It was a summery treat that made me consider going out for after-drinks, until someone handed me a pumpkin tart so friendly and fluffy, it reminded me of quiche lorraine. It changed my mind about going out, and instead, I pulled up the sheets on some inviting bed and fell asleep in this stranger’s home that was not so strange anymore. Pastel was homey in a different sense, like going over to your babysitter’s house, if your babysitter had a sourdough starter named Beyoncé. The entryway wall is chalkboard, covered in rainbow doodles of previous clients. A right turn runs straight into the open kitchen, an unfolding storybook of cooks assembling dishes like kids building sculptures out of blocks. The signature dish, a foie gras mosaic reflective of the restaurant’s minimalist approach, is served as a square with jewels of raw, vinaigrette-marinated, and umeboshi plums; mirin-marinated Asian pears; hazelnuts; and flowers. 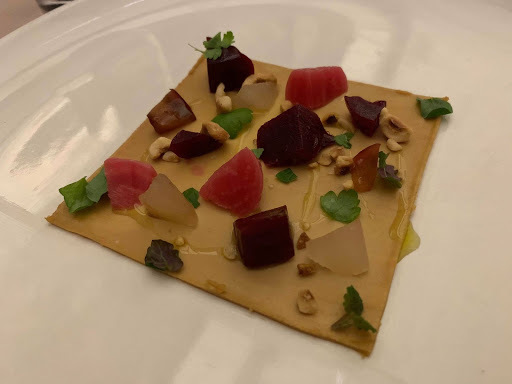 Similarly compact is the bluefin tartare with horseradish cream, which would have been unspectacular if not accompanied by a fairytale, told to the table by co-owner Kabir Kapoor. Replete with iPhone illustrations, he tells of towing the 500-pound bluefin tuna to land – Jonah and the Big Fish, if Jonah were a knight with fish-slaying skills. Duck, rolled into itself and stuffed with more duck, must have been done in the same way a child rolls down a hill. 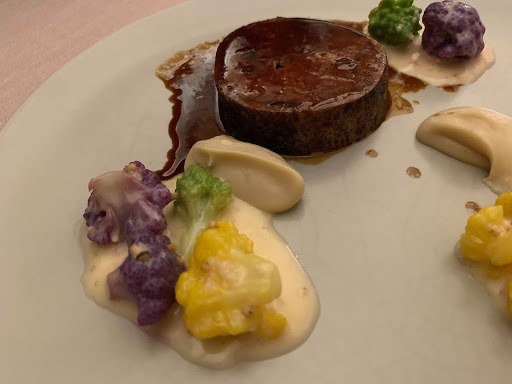 In this rendition, the hill popped with tri-color cauliflowers and levelled out into a tender marsh of beurre blanc and cauliflower cream. A dizzying dish. The other main, cod, was surely touched with some magic from “Madame Pironnet,” who also foraged the plate’s mushrooms. Lemon somehow tasted inherent in the fish, not possibly added by mortal hands. A magic carpet of velvety sauce carried, rather than concealed, the fillet, landing it on an ocean floor forest of creamed kale. Campfire songs ended the final night of this fantastical week at camp. We gathered around the bonfire to ooh and ahh at the liquid graham cracker that pooled out from torched meringue on top a bitter chocolate biscuit. 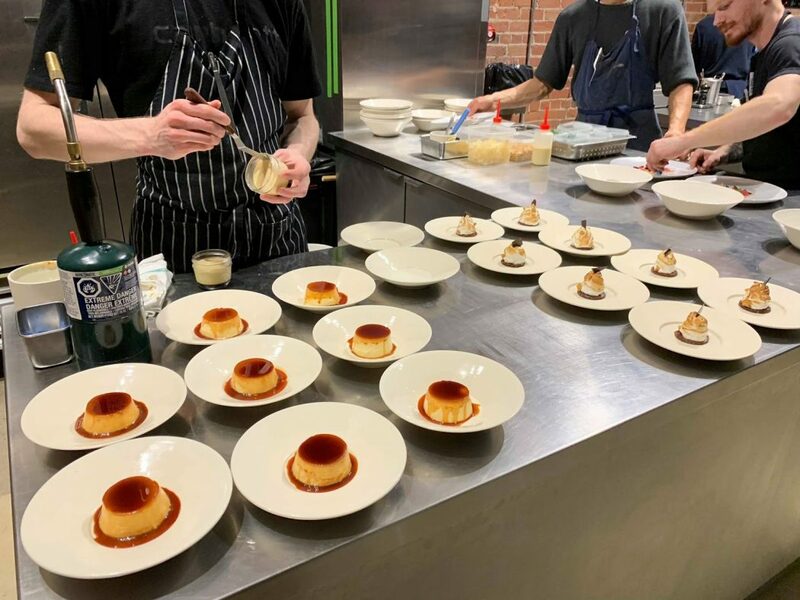 The Indian summer crème caramel, so named because of its base of creamy corn (processed like cereal milk), was reminiscent of running between childhood teepees in August, wiping buttery corn on the cob off chins. At Pastel, the butter was flaxseed oil, the flavor more adult, more like white cotton dresses, but saturated in childhood nostalgia. All photographs courtesy of Evelyne Eng.